Coffitalia 2008, the new yearbook dedicated to coffee in Italy, recently published by Beverfood, provides the picture and an update of the entire sector with precise and careful references to the markets, competition, the companies and the products. The first section, dedicated to markets and products, starts off by focusing on the International business of coffee. Aspects such green production, import-export, consumption, price dynamics and International players as are dealt with. All this is followed by a detailed profile of the Italian market. This section also comprises some articles on the geography of coffee, sensory analysis of espresso and the machinery as well as an overview on the issue coffee and health. The following section is, thus, the most interesting one. It is dedicated to coffee roasters divided by region: more than 600 Italian producers of coffee. This is, for the first time in Italy, a full-blown and detailed survey of the world of coffee roasting: 85% of all existing roasters which accounts for 98% of the total turnover of the sector. For each company, it is possible to find information on its structure and its products. Also specialised suppliers have their own section in which 400 companies are listed: from raw material to machines for horeca and for vending, from packaging to sales materials and coffee consumption. A special section focuses on vending. More than 550 companies running automatic machines are presented here and once again they are listed per region. Finally, there is a section with a review of all the entities, associations – national and international – in the coffee world, or connected to it, as well as of specialised press. 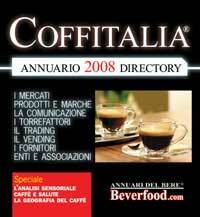 At www.beverfood.com it is possible to read the presentation and give a look at the index of Coffitalia 2008. On the website it is also possible to find contacts and numbers to order it online or by phone. The Professional Barista’s Handbook is an interesting attempt by Scott Rao – American consultant in the USA coffee business – to provide a 360° view on the art of being a barista. “When, 14 years ago, I started working in the business I used to read each and every available book on coffee I could find – says Rao in the introduction. After having read all these books, I was left with the impression that I had not learned so much on how to prepare a great coffee”. In a few words: there was no book with the most relevant and down-to-earth hints for a barista. Given that he could not find any, Rao decided to write one himself with the aim of producing the first truly exhaustive manual for a barista. No doubt that this is a book which covers everything and each topic is dealt with in great detail: percolation, dosing, the methods for levelling the ground coffee in the filter-holder, pressing and, it goes without saying, everything which has got to do with preparing an espresso (more than that: there is also a chapter on tea). The author makes a thorough description with continual reference to scientific research, data and numbers. However, sometimes, Rao suffers from excess of zeal and proposes solutions which could be deemed, quite rightly, a bit complicated and the usefulness of which could be legitimately questioned. If we neglect some overdoing here and there, Rao’s book is a good quality guide. 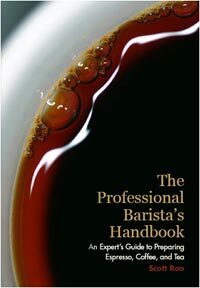 Indeed, it is a collection of most of the things a barista should know if s/he wants to define her/himself a real professional barista.